Accordingly, the “Museum of Genocide” was founded in 1992 (with the word “genocide” referring to Soviet crimes against the Lithuanian nation), and it was only in 1997 that the museum was turned into a full-scale research centre and given the more inclusive name of “Genocide and Resistance Research Centre” (Lietuvos gyventojų genocido ir rezistencijos tyrimo centras, LGGRTC). 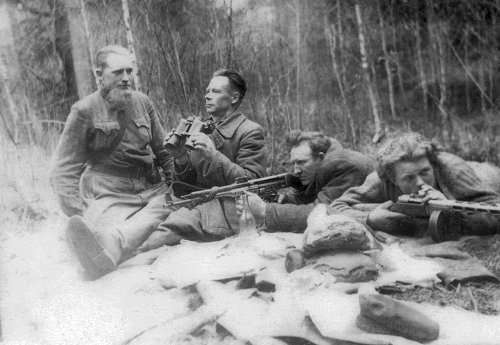 A key motivation for raising the profile of anti-Soviet partisans in the national memory was to emphasize the illegitimacy of Soviet rule by citing the existence of a universal, organized and armed resistance as testament to the continuity of the Lithuanian state. The last two years have witnessed an upsurge in film and TV productions, publications, discussions and organizations focused on restoring and popularizing the memory of the Forest Brothers. One example is Trakiniu Partizanai a public initiative launched and promoted by a group of young activists, including historians from Vilnius University, whose aim is to popularize the memory of the resistance through festivals, discussions, lectures and historical re-enactments. According to its mission statement, this initiative seeks to develop the “open-minded, critically thinking and patriotic” youth in Lithuania. Indeed, the History Department of Vilnius University prides itself on the new cohort of young doctoral students and researchers at work on this topic and seeking to fill in the gaps of knowledge concerning the everyday lives of Lithuanian partisans, their social composition, leadership, etc. Vanagaitė had earlier gained local notoriety and international recognition for her best-selling, popular expose of Lithuanian participation in the Holocaust, entitled “Our People” (Mūsiškiai) and published in 2016. The book provoked heated discussions. On the one hand, it was harshly criticized for its uncritical use of Soviet sources and sensationalist style. That said, it was also widely praised for drawing widespread attention to place of the Holocaust in Lithuanian history. NATO’s recent production of a short documentary on the anti-Soviet resistance brought the debate over the Forest Brothers back to its Cold War origins. Featuring interviews with former members of the anti-Soviet resistance in Estonia, Latvia and Lithuania, “Forest Brothers – Fight for the Baltic” draws a sympathetic link between the anti-Soviet guerrilla struggle for independence in the post-war era and the threats currently facing the armed forces of the three Baltic states. Norbertas Černiauskas in the radio programme “Kita tema” [a different topic] (9 August 2017), retrieved 25 October 2017.